The majority of healthcare consumers use price transparency tools to financially plan, a new survey found, contradicting claims that consumers will shop around for the cheapest providers if they know the price before obtaining care. The survey, released this week by Accenture, reported that nearly half of consumers, 46%, seek price information to budget for out-of-pocket expenses, while just 11% do it to price compare. Additionally, about 60% of healthcare consumers said they will stick with their provider-of-choice even if they know the costs before obtaining care. "This study really revealed for providers that the majority of patients are going to go ahead with the service and just want the information," said Jean-Pierre Stephan, managing director of Accenture. "This is how we in the industry need to think about price transparency, instead of assuming this pricing information is going to result in shopping like other industries, this starts to give an indication that there are other drivers from a consumer perspective." Research shows that the biggest reasons consumers select a provider actually have very little to do with costs, Stephan said. Healthcare consumers value convenient locations, in-network service and referrals from their primary-care doctors, family or friends when they select clinicians. "You are dealing with your health, and perhaps you are willing to pay the premium for those types of values," Stephan said. But consumers show different levels of loyalty to different healthcare providers. About 40% of respondents said they would seek out a cheaper option for dental services while 35% said they would price compare for vision services. At the same time, 15% said they would choose a low-cost provider to help manage chronic conditions and 13% said they would do it for a surgical procedure. However, the rise of high-deductible health plans and cost-sharing is driving more and more healthcare consumers to seek out price information. About 91% of respondents said they want to know their out-of-pocket costs before services. 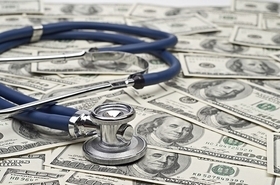 Both insured and uninsured consumers are concerned about affordability, the report found. About 33% of those insured under employer-sponsored health plans said they were concerned about healthcare affordability, compared to 61% of uninsured consumers. "Healthcare is the biggest stressor for U.S. citizens ... It doesn't only impact the uninsured," Stephan said. Providers aren't currently playing a big enough role in helping both their uninsured and insured patients financially plan for services, the report suggested. Of the 49% of consumers who knew their out-of-pocket costs, only 25% got the information from their provider, the survey found. Stephan said healthcare systems and hospitals have a duty to help patients figure out their out-of-pocket costs. Indeed, some providers have created financial departments that reach out to patients and help them financially plan, but it's not a widespread norm. Stephan said physicians have a role to play too. Doctors should have conversations with their patients about their financial situations that may impact their ability to pay for a necessary medication or treatment plan. "There is this whole area of needing to understand the patient's context ... it could help the physician further tailor patient care plans," he said.